With the 2wd championship still up for grabs, Dylan showed his early intention as the only driver to go 18laps in round 1. Denzell took 2nd in the round with 17 laps and everyone else on 16laps. The top 2stayed the same in round 2 with Dylan taking the overall TQ. The pace improved in round 3 with Will and Colin getting into the 17 lap pace. Gary took the win from Ken and looked to continue his dominance of the clubman class. Gary went on to win rounds 2 and 3 from Ken and Chris. Dylan set the early pace on 18 laps to take the round from Colin and Andrew. Round 2 and 3 saw the same finishing order. Gary, running 4wd for the first time this season, took the win from Ray and Emmett. Emmett improved in rounds 2 and 3 into second but Gary held on to win all the rounds. Adam was the biggest improver in leg 1 finishing 4th. Will fought hard to come back from an early mistake for 3rd. Dylan took advantage of TQ and held on for the win from Denzell. Leg2 saw the top 3 stay the same which meant Dylan would finish 1st on the day and 1st in the championship. Final results were Dylan – 1st, Denzell - 2nd, Will - 3rd. Gary won leg1 with a comfortable cushion. The race was for second place with Ken pipping Chris by just under 1s. 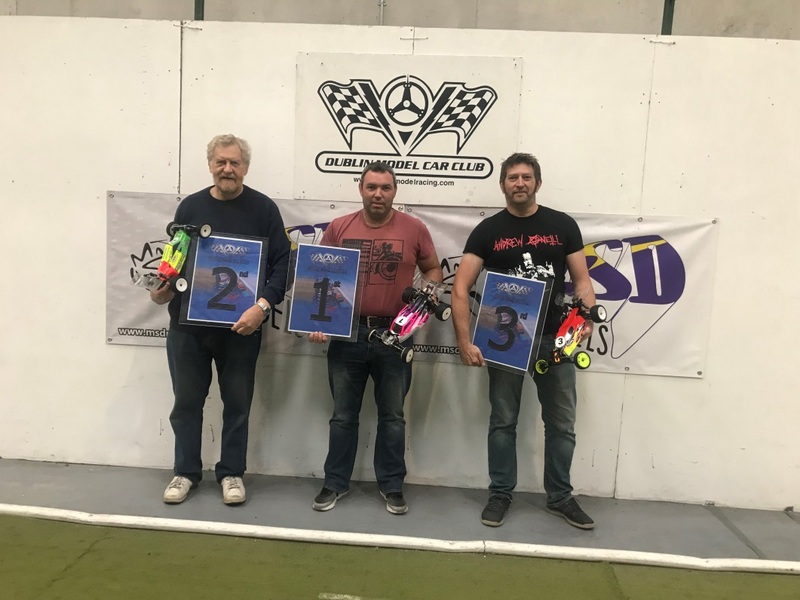 Final results were Gary – 1st, Ken – 2nd, Chris – 3rd. There were no changes in leg1 from the qualifying order with Gary winning from Emmett and Ray. After everyone made early mistakes, the race settled by lap 4 and Gary took the overall. Leg 3 was the same result with no drama. Final results were Gary – 1st, Emmett – 2nd, Ray – 3rd. Dylan maintained his qualifying pace and went 18 laps in leg1 to finish 1st. Colin finished 2nd and Andrew 3rd. The results in legs 2 and 3 were the same as all 3 held their qualifying positions. 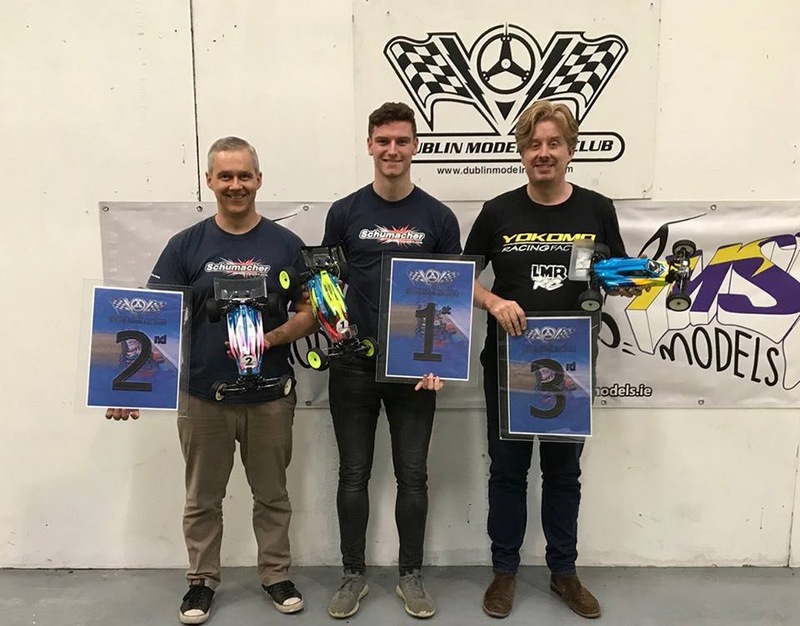 Final results were Dylan – 1st, Colin – 2nd and Andrew - 3rd. Finally, thank-you to all those who turned to up to race and to Lee and the DMCC team for running a great event. 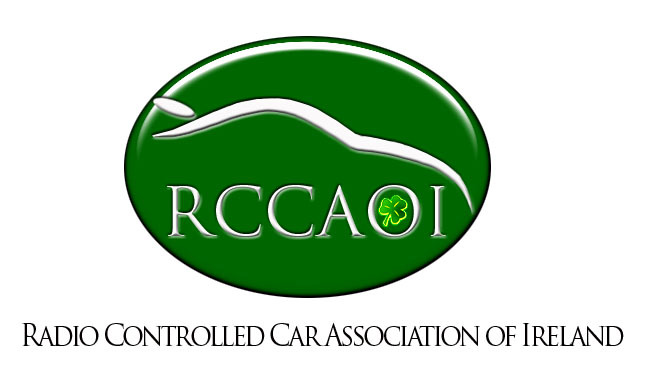 Next weekend the 8th and 9th of September, marks the final round of the RCCAOI National Championship. All eyes in the 1/8th scale off road community will be focused on the astro turf track of Navan Nitro Nuts, Navan Co Meath. 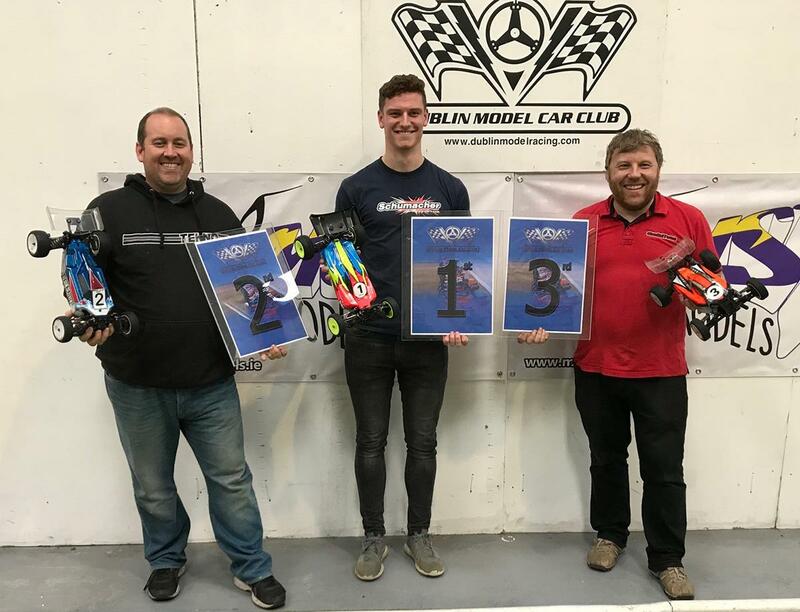 The Nitro final is going to be an exciting one for sure with Alan Scroggie at the top of the leader board with 298 points, Bradley Baird currently in second place with 295, and Paul Myles in third with 293. Barkley Abernethy is not out of the running for a podium finish with 291. All before the count back, so nothing is decided until the final bell Sunday, it is still wide open. 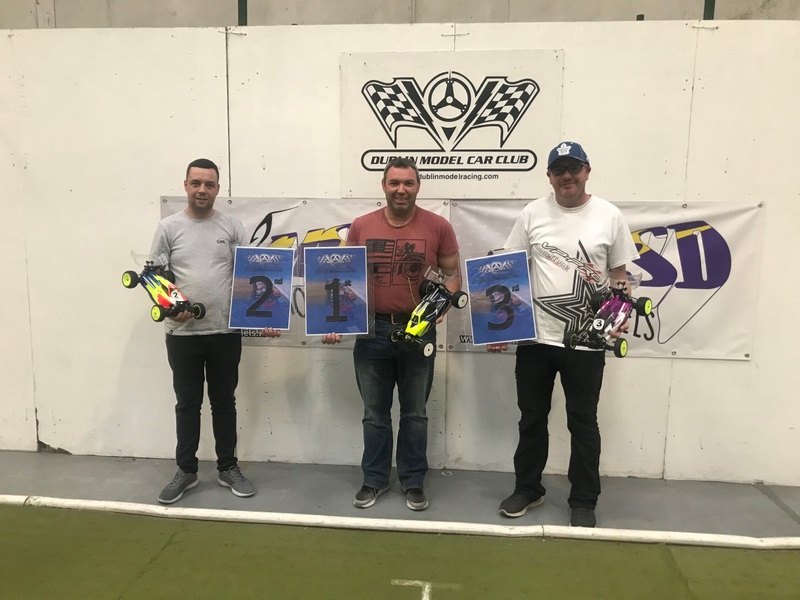 The E Buggy class has Adam Stewart in the lead with 296 points, Conor O’Donovan in second with 291, and Bradley Baird uncharacteristically behind with 200 points. Again, no one has run away with this one either so the betting is wide open here also. With the long-range weather forecast showing 22’ with sunny spells, the turnout is surely to be high, however, accommodation in the area is reported to be scarce due to a big wedding in the area that weekend, so if you have not booked already you need to get on it. Saturday gates open from 10am, open practice from 12 noon to 5pm. Sunday, gates open at 7:30, open practice from 8am to 9:30. First heat starts at 10am.